Our Estate San Saba Vineyard is sheltered in a nook just below the Santa Lucia Highlands AVA, roughly 25 miles southeast of the town of Monterey. Our climate is heavily influenced by the morning fog and afternoon winds from the nearby Pacific Ocean. This is a cool site with little rainfall and one of the longest growing seasons in the world. Our unusual climate allows us to produce ripe, concentrated wines of exceptional balance. Our site’s soils are primarily composed of Arroyo Gravelly Loam and Hanford Gravelly Sandy Loam. The Hanford Gravelly Sandy Loam comes from the SLH bench just above our vineyard. In addition to its excellent drainage properties, our site is essentially free of disease and pests allowing us to plant and farm a portion of our property with own-rooted vines. The estate consists of 72 acres, 67.75 of which are planted to grapes. The varietal mix is Chardonnay (30.44 acres), Pinot Noir (18.11 acres), Sauvignon Blanc (15.44 acres), Syrah (3.60 acres) and Falanghina (0.59 acres).We tailor our trellising, row direction, rootstock, clones and farming protocols to take advantage of the subtleties and intricacies of our terroir. To preserve our local ecosystem, we have worked with viticultural consultant Steve McIntyre to develop and implement a SIP certified sustainable farming program specifically tailored to our unique conditions. In addition to protecting the local environment, we believe it allows us to produce wines that are more authentic and specific to our terroir. This site was first planted in 1973 to Pinot Noir by the McFarland family. Purchased by Steve McIntyre in March 1987, it has been intensely upgraded and subsequently certified as sustainable by the CCVT. Of the 80 acres, 60 are planted to vines and 20 are set aside as a wildlife corridor. This vineyard has the oldest Pinot Noir vines in Santa Lucia Highlands. 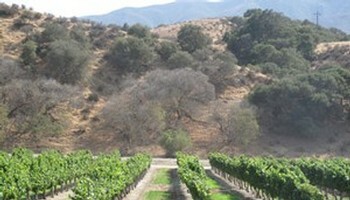 The Doctor’s Vineyard is one of the most celebrated sites in the Santa Lucia Highlands AVA. Located west of the town of Soledad, it is an exquisite parcel perched along the slopes above the Salinas Valley. Of the 243 acres of grapes, 193 acres are planted to Pinot Noir (11 clones), 45.5 acres are planted to Syrah (five clones) with the remainder planted to Malbec. The vineyard was certified sustained by the CCVT in 2011. Wines from the Doctor’s Vineyard are uniformly dark, dense, supple, opulent, structured and distinctive. Father Tondré and son Joe Alarid, both steeped in California’s agricultural history, founded Tondré Wines with the vision to produce a limited production, world-class Pinot Noir from their vineyard, Tondré Grapefield. Tondré Grapefield was planted in 1997 on six and half acres in the heart of the Santa Lucia Highlands appellation. It now has seven blocks for an accumulation of one hundred acres dedicated to Pinot Noir grape vines. 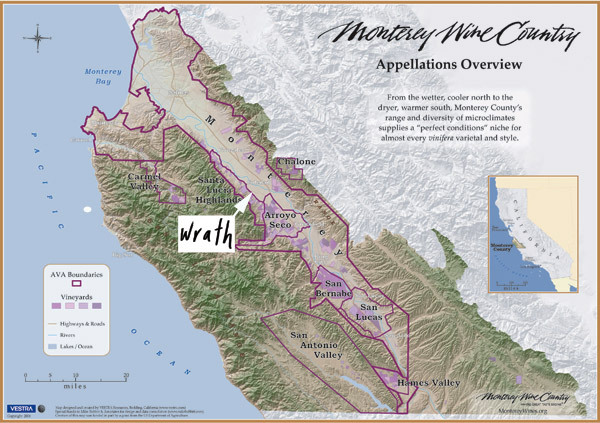 Planted in 2000, Alta Loma is a 246 acre vineyard just west of Central Ave halfway between Greenfield and King City on rolling hills just above the valley floor. 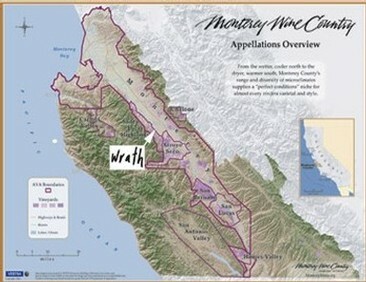 It is biodynamically certified and grows merlot, pinot noir, syrah and two grenache noir clones: Phelps and Bonny Doon. Established in 1998, John Boekenoogen transformed his family’s fifth generation cattle ranch into a vineyard producing outstanding grapes. John’s Great Grandfather, George Boekenoogen, came across the United States in covered wagons in search of gold in the late 1850’s. When gold mining did not pan out as planned George Boekenoogen decided to come to the Salinas Valley, purchase property, and start The Boekenoogen Cattle Ranch. As we all know too well, times change and John Boekenoogen saw the property’s potential of producing high quality wine grapes, he began turning the ground over in the 1990’s just as his Great Grandfather did in the 1870’s but instead of raising hay to winter cattle, John is growing grapes which consist of Pinot Noir and Chardonnay, now in an area that is known as one of the finest wine regions in California for its Pinot Noir and Chardonnay grapes and also becoming known for it’s cool climate Syrahs, the Santa Lucia Highlands.